The latest robot developed by the Swiss Federal Institute of Technology in Lausanne (EPFL) mimics the way a live salamander moves. The salamander robot is called as Pleurobot. The scientists at EPFL studied the X-ray videos of amphibian walking and swimming prior to the development of Pleurobot. According to the institute, scientists had developed the salamander robots in the past, but Pleurobot beats all the other robots with the most realistic movements so far. 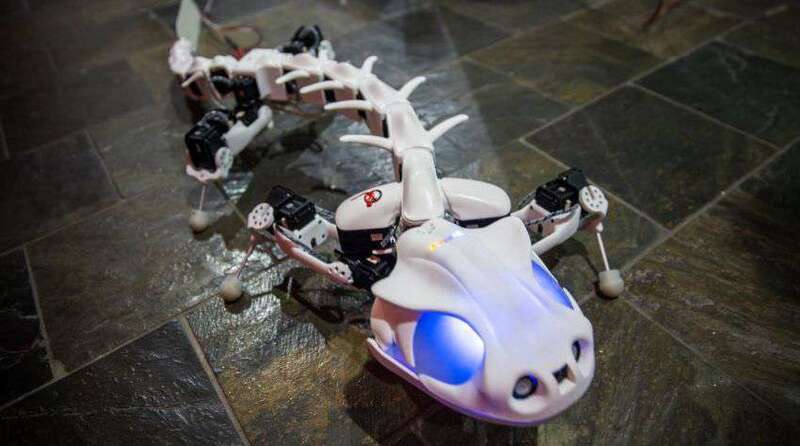 This is the first salamander robot with the precise 3D motion of the amphibian’s skeleton. Team leader Auke Ijspreet says that the Pleurobot aid in understanding about vertebrate locomotion. For this purpose, they made the Pleurobot with 3D-printed bones, motorized joints and an electronic circuitry that acts as the central nervous system. Pleurobot has lesser vertebrae than real salamanders; however the scientists have optimized their placement in such a way to get a realistic look. Electrical stimulation is given in salamander’s spinal cords to make it move. While walking, the lowest level of electrical stimulation is given and while swimming, the highest level is given. This invention helps scientists explore how spinal cord stimulation and a vertebrate animal’s movement is related each other. The invention of the Pleurobot could lead to neuroprosthetic devices for both amputees and paraplegic patients.